The main University campus is located in the town itself. Student housing (the “res”) is at the heart of campus life allowing you to make new friends, be part of the community and be independent while having the convenience of access to classrooms and other University services. AIFS students live in single en-suite rooms with fully-equipped kitchenettes (crockery and cutlery, microwave, fridge and oven). Bedding is provided but not towels. The residence has modern laundry facilities and a common room area for socializing, watching TV or just hanging out. Most of the residences boast lovely courtyards and/or gardens for play and relaxation. Students who bring laptops, can connect to the University network from the comfort of their room. You will also receive a meal allowance worth approximately $700 to subsidize the cost of purchasing meals and groceries. 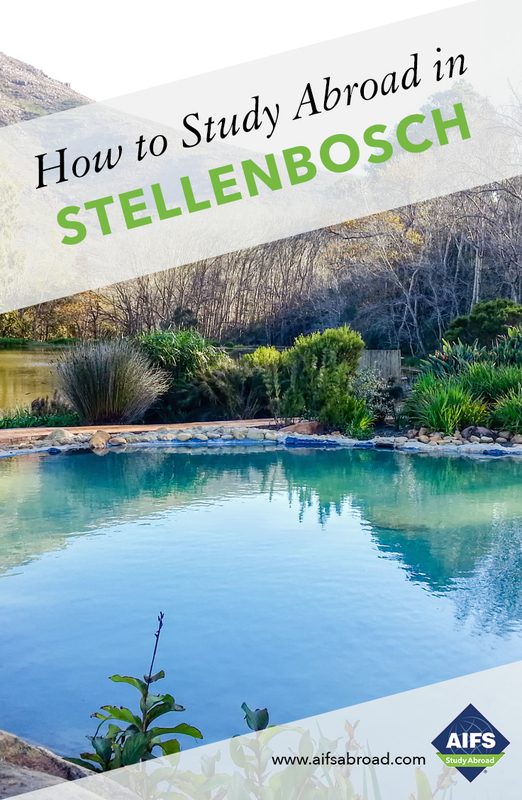 Food prices are very reasonable in South Africa and you can purchase a wide range of fresh, locally-sourced produce in grocery stores and the many cafés and restaurants in Stellenbosch. Students wishing to opt out of the meal allowance can pay a reduced program fee of $14,295. South Africa is a proud sporting nation and Stellenbosch University has great sporting facilities including a gymnasium with weight training and cycling studios, an indoor pool and six aerobic halls offering a variety of classes. Students interested in using these facilities can purchase student gym membership when on site. ISOS-International Student Organization at Stellenbosch University offers events to help international students experience South African culture. Students pay a small membership fee and then they can join subsidized events such as wine tours, weekends away to a local beach town, hikes in surrounding nature reserves and visits to food festivals. Stellenbosch University has introduced a 10-week Inter-cultural competency program which will enhance the experience of visiting AIFS students on campus and in the wider community by taking learning beyond the classroom. Inter-cultural competencies are communicative skills that are learned and developed through experiences in environments that are not one’s home-culture, which positively enhance one’s ability to communicate with, and navigate, cultural difference. These skills give students a flexible framework with a foundation in Africa for engaging with the diversity of a globalized world. Working in small groups, this discussion-based program will involve SU "buddies" (Stellenbosch University students) and students from around the world looking at the question of “What makes you X?" (the X being your nationality) and will give students the opportunity to share aspects of their language, cuisine, politics and the cultural practices which may inform their national identity. In addition to the group work, this course will include 3 excursions to different environments in the Western Cape in order to engage with various cultural, historical, political and social contexts and develop the skills needed to positively communicate in different cultural environments. Stellenbosch University offers a 20-hour, non-credit bearing Volunteerism and Community Engagement (VCE) Program which is designed to deepen practical engagement with Stellenbosch during your semester abroad. Students volunteer at a local school within the wine farms, learning more about the people and the socio-political realities of the region and themselves. A certificate is issued on completion of the program. Over 10 weeks students volunteer at the school designing an after-school activities program in groups alongside VCE staff, teachers and students. This program includes mandatory training sessions designed to help students reflect on the experience. Each spring semester, a group of AIFS students volunteer with the Cape Town Carnival working with a non-profit organization to help young people prepare for and take part in this celebration of African creativity and diversity. Stellenbosch will host a major art festival in Spring 2020 focussing on contemporary African art. The Triennale will be organized by the Stellenbosch Outdoor Sculpture Trust (SOST), a non-profit organisation that has arranged a variety of public art projects in the town in recent years. This “town-wide exhibition of showcasing the finest contemporary art work from selected African countries” will draw visitors from around the world, and interested AIFS students will have the opportunity to volunteer at this arts festival during the semester. More information will be available from the AIFS RD on arrival in Stellenbosch.